On the banks of the Potomac circa 1914. 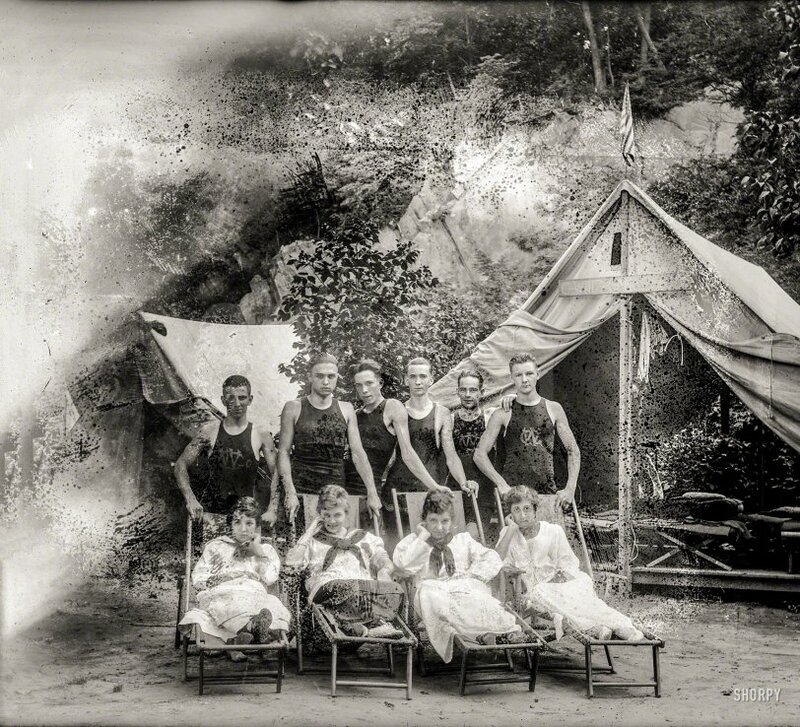 "Summer camps: G. Whiz Canoe Club." National Photo Company Collection glass negative. View full size. Submitted by JDC_OKC on Tue, 09/29/2015 - 7:28am. The name of the woman on the right is Ennui d'Istaste. Submitted by switzarch on Mon, 09/28/2015 - 2:07pm. The ravages of time to the negative just heighten the atmosphere of this photo. Gee Whiz, wish we knew more about this motley group. Submitted by Solo on Mon, 09/28/2015 - 9:29am. The ladies are striking a fashionably languid pose, a la Vilma Banky, but Sadie is inclining on her "other left." Submitted by theoeva on Mon, 09/28/2015 - 6:50am. The way the girls' heads are down and their hands placed coquettishly on the chin and the boys' hands on the chairs above them. This is not a formal type photo usually done in that era. It actually somewhat provocative in a way. Wonder why those tents are so close? Submitted by davidk on Sun, 09/27/2015 - 6:53pm. Mothers or girlfriends? wonders Mr Mel. Are they canoeists, too, perhaps, simply attired less fleshily than the men? Submitted by Sagitta on Sun, 09/27/2015 - 4:06pm. I actually found references to this group from the mid 1910's in old DC newspaper articles. Apparently the G Whiz Canoe Club originated from Camp G Whiz, which was located somewhere about 2 miles north of Aqueduct Bridge. They made their debut in the Washington Canoe Club Regatta in 1913 or 1914 (the article dated July 17, 1913 didn't specify). The canoe club pops up a few more times over the next two years, but stopped getting hits in my search through the newspaper archives by 1916, which probably dates the photo to 1913-1915. Submitted by Mr Mel on Sun, 09/27/2015 - 3:48pm. I'm trying to figure out if some of those women are the guy's girlfriends or their mothers. Isn't there a Hyatt around here? Submitted by DoninVa on Sun, 09/27/2015 - 2:47pm. As it is today, 25% love camping, 50% put up with it, and 25% really hate the idea. Submitted by Paul A on Sun, 09/27/2015 - 2:40pm. Wow, this one is like a microscope slide but the underlying composition is really great! I can't imagine lugging one of those tents with the heavy canvas and wood supports.